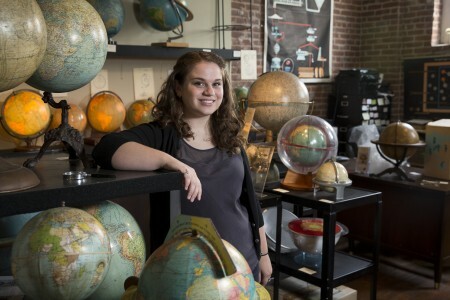 Katie Snyder ’15 immersed herself in the world of antique globes this summer. Snyder was seeking an internship at a museum, but she received an offer from Omniterrum, a company that sells globes in a store in Lynchburg. The story also helps museums acquire antique globes with historical significance. Once she walked in, Snyder knew she was ready to accept the offer. She also worked on contacting the family of a historic globe maker who recently passed away to inquire about making archives of his documents. Snyder, who is majoring in classics and in art, with an emphasis in art history and museum studies, said that archiving is not always the most exciting work, but it is an important part of documenting history. Having this assignment on her resume will demonstrate to graduate schools and future employers that she is not deterred by the sometimes tedious tasks that accompany research and museum work. “I’m willing to have the patience to do what needs to be done,” she said. Thanks for your lovely blog regarding globe collecting. I hope you don’t mind we posted it on our FB fan page, a community of almost 800 globe aficionados world wide .